High river flows in the Snake and Columbia rivers and resulting involuntary levels of spill over dams are rendering moot court-ordered spring spill to state-mandated caps on total dissolved gas. Recent warm weather is melting snow and causing high water in most of the Columbia and Snake river basins. River flow at McNary Dam Wednesday hit 490,000 cubic feet per second and the Columbia River level at Vancouver hit flood stage at 16 feet early Thursday morning. However, so far this month the court order is largely moot as high flows are causing high involuntary spill at all lower Snake and Columbia river dams. TDG May 10 and 11 exceeded the gas cap set by Oregon and Washington at Lower Granite Dam, hitting 121 percent TDG in the dam's tailrace (the tailrace gas cap is 120 percent). However, the Corps is finding it difficult to keep the TDG in the Little Goose Dam forebay (the dam immediately downstream of Lower Granite) at or below the 115 percent forebay gas cap when actual spill exceeds the target spill of 31 - 33 kcfs. Spill was as high as 51 kcfs May 11. As a result, the forebay TDG limit at Little Goose has been exceeded five times this month, Dan Turner of the Corps' River Control Center told the interagency Technical Management Team at its meeting Wednesday, May 15. Turner said flows have dropped at Lower Granite the past few days but are expected to rise again late this week. He expects involuntary spill at the dam to continue through at least May 29. Target spill at Little Goose Dam is 28 - 30 kcfs, but the dam spilled 65 kcfs on May 11. That involuntary spill has resulted in gas cap exceedances five times in the tailrace, but nearly every day in the downstream forebay at Lower Monumental Dam. Lower Monumental target spill since May 1 has been 27 - 31 kcfs, but the target has been exceeded six times and the downstream forebay TDG at Ice Harbor Dam has been exceeded every day this month. Spill was as high as 105 kcfs at Ice Harbor Dam this month, while the target was just 80 kcfs, causing TDG exceedances on seven days this month. TDG hit 134 percent in the tailwater of McNary Dam May 15 and 16, exceeding the state gas cap by 14 percentage points. Spill on those days was 370 kcfs and 362 kcfs respectively, while the target was far lower at 145 kcfs. McNary has exceeded the spill cap in its tailwater nearly every day this month. Downstream in the John Day Dam forebay TDG has been higher than the 115 percent cap since May 5, hitting 131 percent May 15. Target spill at John Day is 90 kcfs, but actual spill has exceeded that level every day this month, hitting a high of 275 kcfs May 16. That produced a TDG of 143 percent. Downstream at The Dalles Dam forebay TDG has exceeded the 115 percent cap since May 5 with a high of 130 percent May 15. Target spill at The Dalles is 90 kcfs, but that has been exceeded every day this month, with a high of 301 kcfs May 13, producing TDG in the tailwater of 127 percent. Downstream in Bonneville Dam's forebay, TDG has exceeded 115 percent all month, with a high of 128 percent on three days, May 13 - 15. Turner expects involuntary spill at The Dalles to continue into mid-June before river flows decline into August. TDG in the Bonneville tailrace hit 128 percent May 13. Target spill is 121 kcfs, but actual spill has been as high as 311 kcfs. A result of high spill levels at dams is gas bubble trauma found in some juveniles. Some 17 percent of chinook and steelhead sampled at Bonneville Dam had signs of GBT May 15, but just 1 percent to 2 percent showed GBT signs at Little Goose, Lower Monumental and McNary dams. See www.fpc.org/currentdaily/gbtsum.txt. 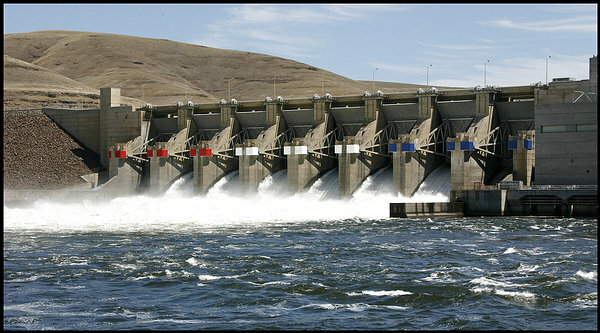 McNary and John Day dams are currently carrying reserves of 25 megawatts each, meaning that water that would produce that much power at each dam is either held or spilled until the region needs the power. "We can either run that water through the turbine or spill it," Tony Norris of the Bonneville Power Administration told TMT. "It is a tool we could use to lower TDG," although holding reserves is only deployed about 5 percent of the time. Taking Norris up on his offer, salmon managers at TMT requested that BPA and the Corps run that water through turbines rather than over spillways as a way to control TDG. The request will continue through Friday, May 25 and will be revisited at TMT's next meeting May 23. BPA has said the additional spring spill to gas cap levels will cost the power system as much as $40 million in lost revenue this year because the water will be spilled and not used for generation.